Q: What is Luxembourg’s favorite fast food joint? Q: What do you call a thief in Luxembourg? 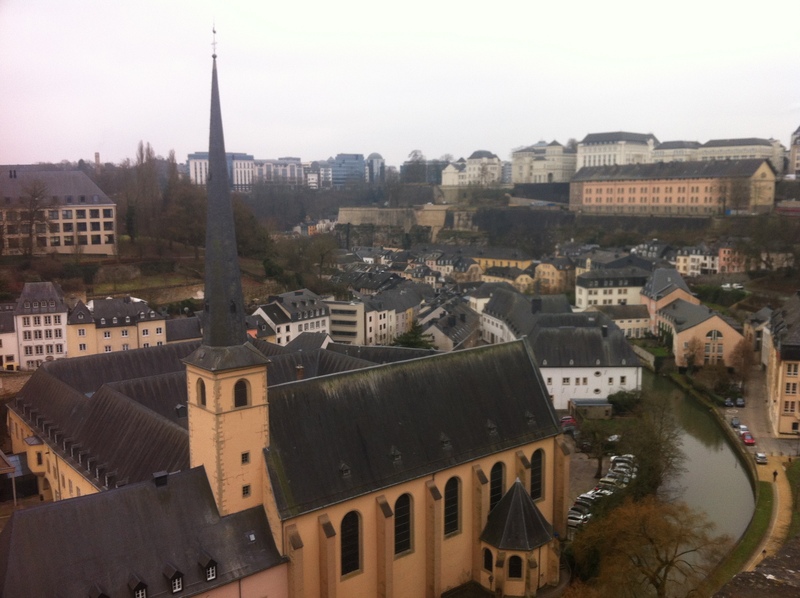 I jest, but the reality is this: if you’re looking for a corner of Europe that has managed to retain its sleepy, Brothers Grimm charm, Luxembourg is it. I knew it immediately as our plane dipped down through a quilt of cloud and the slumbering village poked its head up to greet us. It could scarcely be called a city: rolling patches of green seemed to stretch for miles, separating huddled clusters of homes and churches and giving way to nothing but tall, thin, inky trees. We descended, and the mist seemed to crawl drowsily over the town as if it were under a spell. Apart from the drone of the KLM engine, it felt like we’d been plopped in a place where wolves ate lonely old ladies and it was entirely plausible to find a cottage inhabited by dwarves if you were willing to look hard enough. > It can fit inside the state of New Jersey more than once. > A relatively fit individual can walk its perimeter in three days, or so I’ve been told. And holy smokes, was it cold. Cairo has distorted my perception of weather; I shiver at the pub at night and practically hug the heat lamps, but Luxembourg felt like a trip to the Arctic. I was glad I’d brought my winter coat, and both days were triple-sock days. We had journeyed to Luxembourg to visit Sido, a Cairo Rugby vet who had relocated there a few months ago. My party consisted of myself; Gretel, a lively Minnesotan with an incomparable joie de vivre; and Claire, whose family we were staying with. Claire, a fluent francophone, was raised by Irish parents in Luxembourg. In addition to French and English, she studied and taught Irish and, we learned on this trip, can be very persuasive. (More on that later.) For kicks, we decided to play a game throughout the trip called Claire vs the Lonely Planet. We’d ask Claire a question about her country and if she couldn’t answer but the LP could, it got a point. “What records has Luxembourg set?” Gretel asked. We were sitting in Claire’s kitchen while her father grilled cheeseburgers and brewed me some much needed coffee. “I don’t think it’s set any,” Claire replied. Gretel thumbed through the book while I listened to Claire’s father’s story about his move to Luxembourg, a tale that’s testament to the charm of Luxembourg: her parents, both from different parts of Ireland and equal parts hospitable and good craic, moved there for separate reasons, met, married, and decided not to return to Ireland. I feel like a country has to have a lot of perks if you’re willing to bin Ireland for it. What’s interesting about Luxembourg is that the new, more cosmopolitan sector exists symbiotically with old forts and casemates. You’ll be browsing shop windows one minute and then wandering cobbled streets through crumbling castles the next. The Old Town preserves the city’s history and architecture, its squares teeming with dancing statues or solemn war memorials. 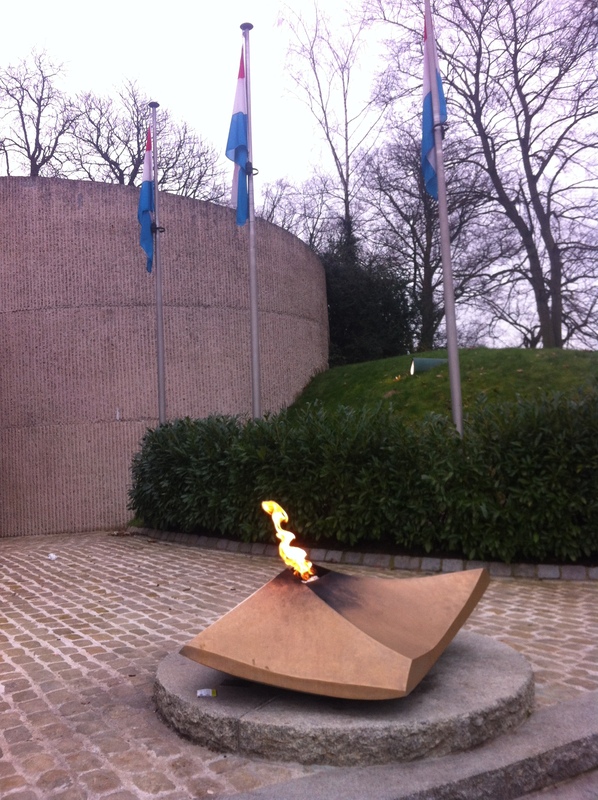 We started our cold walking tour at Place de la Gare and followed it toward the Chemin de la Corniche to warm our hands at the Eternal Flame, which felt a little crass, as it’s a memorial to those who died during WWII. Curious as to Luxembourg’s role in WWII, I skimmed my LP and was rather dismayed to stumble across only two brief sentences: “Germany occupied the city during both world wars. Liberated in September 1944 it was used as one of the Allied command centres at the end of WWII for the Battle of the Ardennes.” There didn’t seem to be anything in my Lonely Planet about the flame, so I did a quick Google search to see if perhaps it had been erected post-publication. Wikipedia yielded a list of eternal flames in Europe. Unable to find Luxembourg among the countries listed, I clicked the link for “Elsewhere” and found it crammed somewhere in a long list of countries Wikipedia does not quite consider to be European. 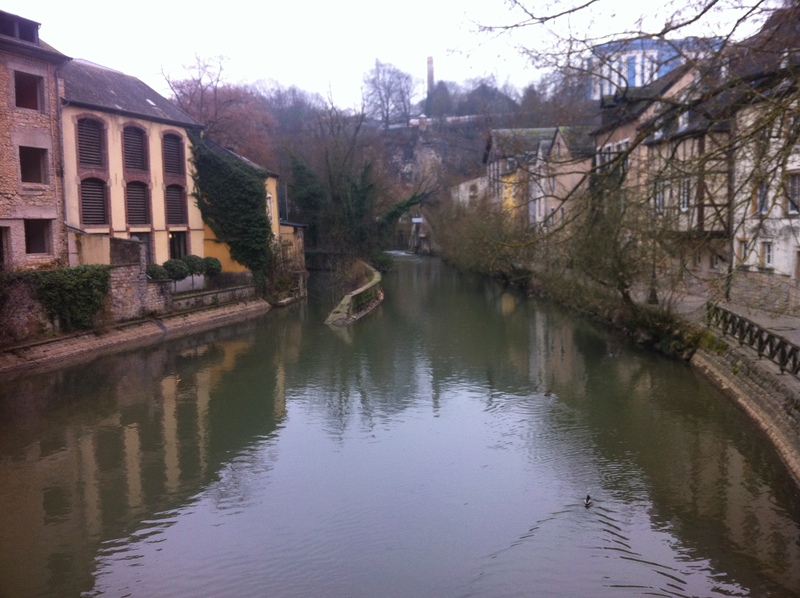 It made me feel indignant at first, like one might pity a shunned stepsister or an injured pigeon, but then I realized that this marginalization of Luxembourg is precisely what enables it to retain its unique sense of timelessness. Following the road inward a bit, we came upon Cathedrale Notre Dame, a smaller counterpart to its behemoth European cousins, and ducked inside for a bit of warmth and awe. I’m of the mindset that if you’ve seen one Cathedral, you’ve seen ’em all, but there was something especially cozy and welcoming about this one. Normally, I get the feeling I’m entering a cavern rather than a church, with towering ceilings and icy interior. I’m not certain why this one felt different – perhaps because it was warm – but I enjoyed a slow stroll around, gazing up at the stained glass windows. 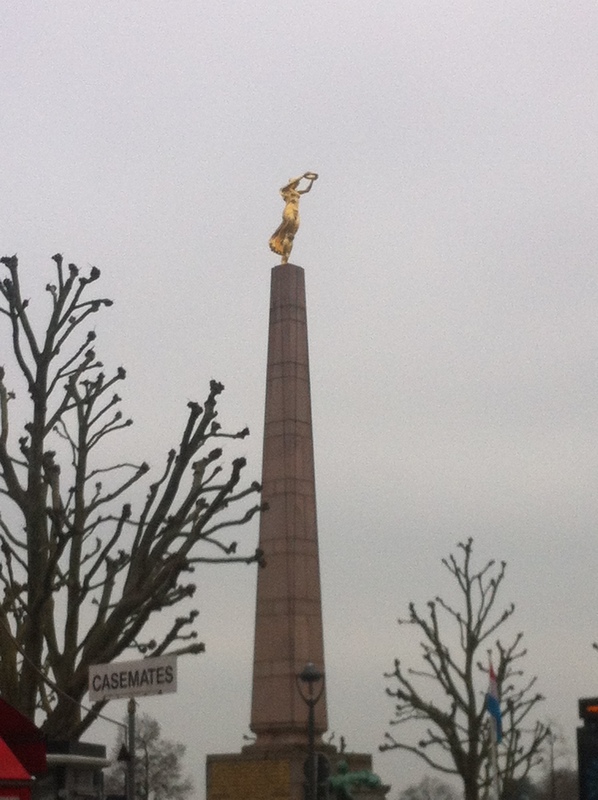 We left – me, shivering and reluctant – and found ourselves standing in the Place de la Constitution at the towering Golden Lady, a WWI monument to Luxembourg’s deceased. Here, we met Claire’s mother, who took us to the Royal Palace, an architecturally aesthetic building splashed with color and guarded by a man who casually marched back and forth in front of the door. What LP doesn’t tell you: across the street, through an unremarkable door, is the Chocolate House, a restaurant most probably created on a cold January afternoon for the purpose of warming hands. 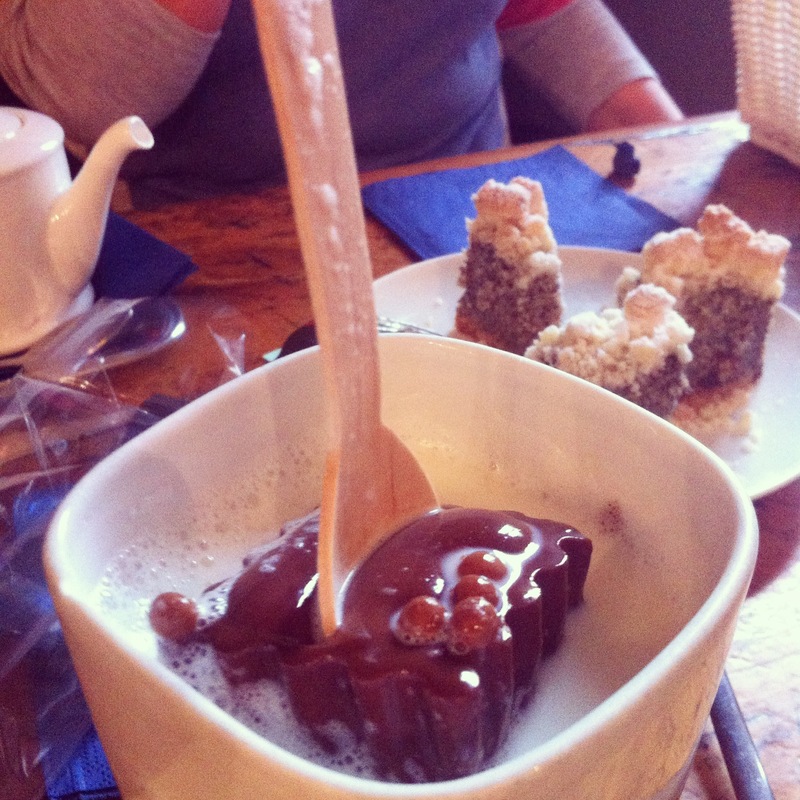 Over peculiar poppy seed cake – and steamed milk, served with a massive slab of chocolate on a wooden spoon that melts in the liquid – Claire’s mother told us about the Luxembourgish royal family, a far fling from England’s famous crew. I struggled to imagine running into Kate Middleton at a bazaar and talking about clothes. Does she even do her own shopping? Surely she has someone to do it for her. As we headed back to Claire’s to get ready for an evening out, I realized that, in the three hours we’d been there, I’d already been quite dazzled by Luxembourg. I will forgive you if you stop reading right now and go eat a piece of chocolate.